Apartments Adler Resort by Alpin Rentals price per day from € 114 Just 500 metres from the centre of Kaprun and 1 km from the Maiskogel Ski Lift, Apartment Adler Resort by Alpin Rentals has a sauna that can be used free of charge. The apartment features 2 balconies, 2 bedrooms, a living room with a sofa bed and kitchenette, satellite TV, and a bathroom with a shower and toilet. Apartments Gletscherblick price per day from € 52 Situated just a 5-minute walk away from Kaprun’s centre, Apartments Gletscherblick offers a view of the Kitzsteinhorn. Each of these apartments has a well equipped kitchen and a dining area. Studio KITZBLICK - Kaprun Studio Kitzview - Kaprun is a self-catering accommodation with a balcony providing views of the Kitzsteinhorn Mountain, located in the centre of Kaprun. Accommodation features a flat-screen TV with cable channels and a well-equipped kitchenette with a dishwasher and a refrigerator. All Seasons Lodge by All in One Apartments price per day from € 175 . Apartments Obernosterer price per day from € 80 The stylish Obernosterer apartments can be found a 10-minute walk from the centre of Kaprun. The Schmittenhöhe-Zell am See Ski Area is a 10-minute drive away. Featuring elegant parquet flooring, solid wooden beds and comfortable sofas, each apartment invites you to relax after a day out in the mountains..
Appartement Pension Bergfried price per day from € 55 Offering panoramic views over Kaprun and the Kitzsteinhorn Mountain, Appartement Bergfried is right next to the Maiskogel Ski Lift. Furnished in a traditional Alpine style, all apartments feature a kitchenette with a dining area, a flat-screen cable TV, and a bathroom with hairdryer. Guests of Appartement Bergfried can play table tennis in summer, as well as tabletop football throughout the year..
Appartement Kaprun Haus Rudolf price per day from € 115 Haus Rudolf offers a spacious apartment directly below Kaprun Castle and 500 metres from the Maiskogel Ski Area. It includes free Wi-Fi and a balcony with views of the Kitzsteinhorn Glacier and the Salzach Valley. Agricola Villenwohnungen price per day from € 84 The Agricola Villenwohnungen enjoys a quiet location surrounded by meadows, a 5-minute walk from the centre of Kaprun. All apartments have a balcony and free wired internet access. Guests of the Agricola can use the on-site sauna free of charge. 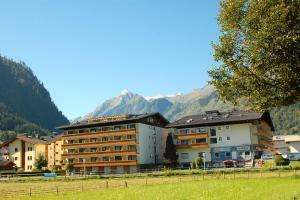 Appartements Mary price per day from € 65 Located in Kaprun, Appartements Mary has a spa area with different saunas. Apartments Mary have modern furnishings, a LED HD TV or a flat-screen TV, free WiFi, a balcony or terrace with views of the Kitzsteinhorn Mountain, and a bathroom. Pension St. Georg price per day from € 90 A 10-minute walk from the centre of Kaprun, Pension Sankt Georg features an in-house ski school and a small spa area. Traditionally decorated with wooden furniture, the rooms at Pension St. Spa facilities include an infrared cabin, a solarium, and an outdoor sauna with mountain views. 1. Head north on Vogelweiderstr.150 toward Pauernfeindstr. Continue to follow B150. 4. Keep right to continue on E55, follow signs for A10/Italien/Slowenien/Graz/Villach/Turkey/Greece. Toll road. 7. At the roundabout, take the 1st exit onto Kaprunerstr. 8. Turn right to stay on Kaprunerstr. 9. Turn right to stay on Kaprunerstr. 11. Turn left at Kaprunerstr. 12. Continue straight onto Schloßstr. Destination will be on the left. Ski resort Abtenau, altitude: 1480m. 54 km from town of Kaprun. Ski resort Achenkirch, number of cross country pistes: 58km. 85 km from town of Kaprun. Ski resort Afritz, downhill pistes: 16km. 99 km from town of Kaprun.